Has your child been labeled hyperactive? Has your parent been diagnosed with senile dementia? Did your doctor prescribe Prozac for your so-called depression? If you answered "yes" to any of these questions, you need A Dose of Sanity. Each year, hundreds of thousands of Americans who are actually suffering from common medical conditions such as hyperthyroidism, Lyme disease, and even poor nutrition are misdiagnosed with psychiatric disorders. Studies show that the rate of misdiagnosis is more than 4 in 10. 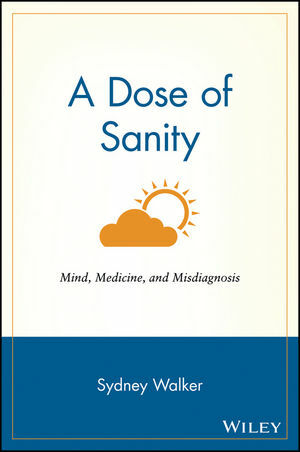 In this powerful book, practicing psychiatrist Dr. Sydney Walker explains why psychiatric misdiagnosis is so common. More importantly, he helps you and those you love avoid the misdiagnosis trap. Dr. Walker's unique 24-Hour-Day Profile lets you track physical and emotional changes over the course of a day to give your physician valuable clues to what your symptoms really mean. SYDNEY WALKER III, M.D., is a board-certified neuropsychiatrist, Director of the Southern California Neuropsychiatric Institute, and founder of Behavioral Neurology International. The Psychiatric Bible and the Dangers of Misdiagnosis. What's Really Wrong with You? Talk Soup Can Make You Sick. How to Protect Yourself, and Those You Love, from Misdiagnosis. "But I'm Not a Patient!" Where Do We Go From Here?